Surprisingly, my excite-o-meter was a little bit higher for this book than it had been for the previous. At the very least, I didn't catch any overused phrases or words, though the author DID try to use more varied versions of someone putting his or her hands (fisted) on his or her hips in an angry fit. But that's moot. 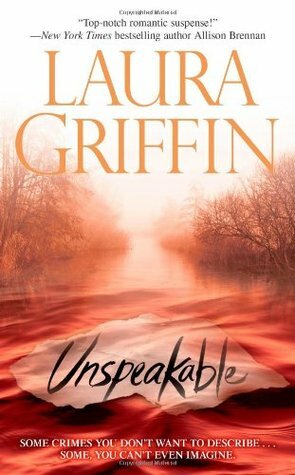 Unspeakable was more of a page-turner than Untraceable was, and that was probably what pinged my radar. There was no lack of activity... except for the fact that there kind of was a lot of loitering and lack of progress. While I liked this story's plot more for it being a bonafide murder mystery, I didn't like it as much for it's lack of character development and story progression and the fact that there were a lot of minor plot points with a lack of a well-rounded conclusion. Even the ultimate murder mystery resolution felt like it came out of left field and didn't do much for me and my amped up excite-o-meter. I was a little deflated by the end. Elaina McCord is sent to help an investigation on Lito Island, Texas where girls are surfacing in remote, swampy marshes in gruesome murders. Elaina, fresh out of Quantico and having spent more time pencil-pushing than anything else, is elated to be given her very first homicide assignment. But the "Big Boys" of Lito Island take one look at her and readily blow off any help she can offer as well as her theories on the serial killer's profile. Except that, time after time, each of her theories pan out. And yet the local law enforcement (and even her own supervisor) continue to give her grief about how out of whack all of her theories are. She believes a murder from nine years ago was this unsub's first kill and get's laughed at because they already have a killer behind bars for that one--she turns out to be right. She believes they have a serial killer with law enforcement knowledge and possibly aspirations to be in law enforcement, but the local police just shake their heads in incredulity--again, she turns out to be right. She believes that the dragonfly symbol that keeps appearing is connected to the murders somehow, but no one will give her the time of day--again, she turns out to be right. Meanwhile, Troy Stockton has taken interest in these cases because he'd written a best-selling true crime novel about the nine-year old murder that another man had taken responsibility for. If Elaina's theory turns out to be right, then that means his entire novel was wrong and all of his research into the murder was a waste of time. First of all... I'm a little confused as to why Elaina would be sent on a homicide investigation by herself. I thought FBI always worked in tag-team partner groups. Secondly, if she's so green, why are we even sending her by herself to assist a homicide investigation? I feel like there had to be some sort of protocol breach in this kind of decision, but then again, I'm not law enforcement, so what do I know? While I loved that Elaina is a kickass FBI agent who is able to hold her own, I didn't like that she was not proactive enough to stand up for herself. Her theories kept getting proved to be correct, but she just goes and slinks into her own corner, waiting for the "Big Boys" to let her play. I figure that this is maybe lack of confidence in her own skill? But then she's so confident in her own theories that she goes and follows her own leads. So I'm not sure what it is about her that's not working. Of course, I guess I can't quite fault her for having these paranoid ideals about her career when her own father tries to roadblock her success. The main positive about Elaina is that I like that she's NOT "Rambo Chick" and that her strength is the ability to think outside the box in an investigation without breaking too many rules. When hunting monsters in today's society, I think that's a pretty good trait to have. And Troy... he just doesn't do anything for me. He doesn't stand out as anything more than the typical broody alpha male with a "taking care of my woman" complex". While I understand the need to be protective of those you care about, we seem to keep forgetting that Elaina is a trained law enforcement officer--she is an FBI agent and no matter how green she is, she is still an FBI agent and her job is to capture the bad guys. Her job is not to sit on the sidelines and stay safe and let "The Man" take care of all the problems. Unspeakable was entertaining, and I found that I DID like it a little bit more than I liked Untraceable. But I felt like there were entirely too many little side plots and plot devices happening all around the main conflict. I appreciate being introduced to new characters who will later on have their own stories, and couples who begin to develop a history before their book happens. However, sometimes you can insert too much foretelling that may crowd out the current story line which, well, depending on how much I end up liking the "new person intros", could hurt the current story's own focus. What I liked about Troy and Elaina's relationship is that they meet within the confines of this story and develop their romance as the story progresses. Unfortunately, what I didn't like about Troy and Elaina's romance is that it lacked chemistry and a credible development from lust to love. And also, given Troy's romantic back history of cheating on his girlfriends no matter how much he cared about them... I'm a little wary of where this particular relationship will go; and I'm a little disappointed that, as a romance, this issue was never discussed or even brought up.